NGO Service for the Health in Asian, African Regions (SHARE) is a non-governmental organization established in 1983 that develops human resources and assists people and their communities in protecting their health. SHARE works in Japan, Thailand, Cambodia, East Timor, and South Africa. SHARE has responded to a number of international disasters, including the 2004 Chuetsu Earthquake and the 2005 Kobe Earthquake in Japan. Direct Relief has supported SHARE since March 2011 with over $250,000 in cash grants to fund their Tohoku Earthquake and Tsunami relief and recovery efforts in Japan. SHARE began relief activities one week after the earthquake and tsunami struck Japan in March 2011. Funding from Direct Relief was used by SHARE to provide medical care to disaster victims. As a result of needs assessments, SHARE decided to focus their support on vulnerable populations in Kesennuma, including elderly people, handicapped people, expectant mothers, and infants. Kesennuma in Miyagi Prefecture was one of the areas hit hardest by the earthquake and resulting tsunami and fires. The emergency medical services provided by the NGO Service for the Health in Asian African Regions (SHARE) have addressed the short- and long-term needs of disaster victims. Services have included the provision of medical staff, supplies, and other healthcare services to victims in Natori and Kesennuma in Miyagi Prefecture. Based on ongoing evaluation, these services will continue through the end of the year or until the local medical care system is again able to address the medical needs of the city’s residents. Kesennuma was one of the most devastated areas after the March 2011 earthquake and tsunami. In a city of over 78,000 residents (before the disaster), more than 1,500 people died and 3,800 were displaced. An unknown number of people did not leave their damaged homes. Based on assessments made in the area, SHARE has focused on support for elderly people, disabled people, and expectant mothers, and infants, who continue to live in Kesennuma. Clinic Support Program: During the emergency phase of the disaster, Tohoku Kokusai Clinic in Natori City was the only clinic opened in the area and was charged with treating patients with acute medical conditions, as well as those with chronic medical conditions, particularly those who are elderly. SHARE deployed 21 doctors, 18 nurses, and 15 logisticians to the clinic which allowed clinic operations to continue uninterrupted – 24 hours a day, 7 days a week. During the emergency phase, the clinic initially saw up to 80 patients per day. The clinic returned to normal operation on March 28, 2011. Medical Outreach: SHARE medical staff and volunteers evaluate the nutritional statuses and overall physical health of disaster victims. Based on their evaluations, the volunteers refer to the recommended healthcare provider for chronic and non-chronic medical conditions. SHARE provides services via mobile clinics, which make primary healthcare accessible to all residents. Over 450 doctors, nurses, and other volunteers have participated in over 2,000 home visits. Common health problems observed are gastrointestinal issues, cold, diabetes, high blood pressure, and mental illnesses. Community Activities: SHARE invites adults and children to participate in community activities, such as a mobile zoo, in order to promote socialization, communication, and general well-being. 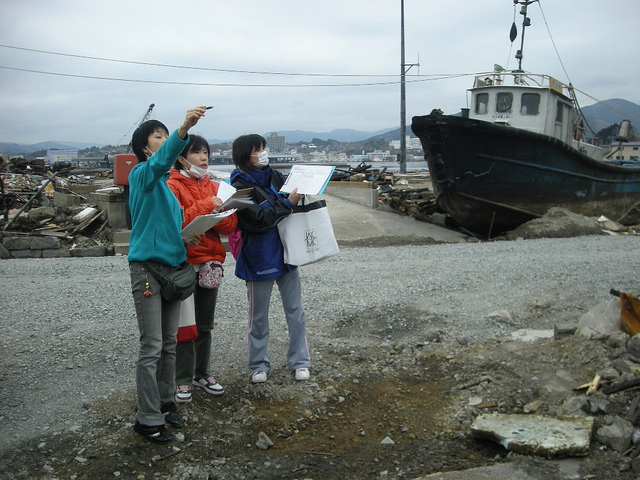 Mutual NGO Support: To facilitate the continued improvement of the health situation in Kesennuma, SHARE is supporting local volunteer organization, Project K, who is collaborating with local authorities and other NGOs to promote community health. SHARE is providing advice and resources, including office space, supplies, and staff, to help launch Project K and see that they are successful and sustainable. SHARE aims to organize and provide necessary daily life and health care support for the community of Hashikami, Kesenuma City. This community suffered from widespread damage due to the earthquake, tsunami, and subsequent fires. About a third of the population of this community now benefit from the services of SHARE and partner Project K.
Capacity Building for Project K: New non-profit organization Project K (for “Kesenuma”) is receiving mentoring and advice in order to operate independently carrying on similar relief work in Kesenuma. Daily Life Support: A community space named “Hashikami Kouryo Hiroba” is open every day to provide health and wellness consultations for people in the community. SHARE and Project K are also visiting temporary housing units as needed, providing the place and opportunity for health education and health consultation for elderly people living in temporary housing. This includes exercise classes, lectures, and health checks. The most common health conditions reported are high blood pressure, cold, diabetes, mental illnesses, and insomnia. Temporary Housing Community Support: SHARE is assessing the situations and needs of temporary housing residents. On average, 73 visitors per month utilize the community space Hashikami Kouryu Plaza. SHARE and Project K also support 7 community associations which serve to inform the community and provide services.